F. & R. Lazarus & Co. 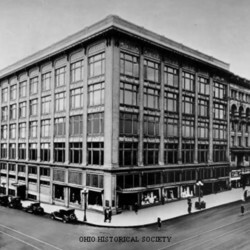 The term "Department Store” as we know it doesn’t appear as its own category in the Columbus city directory until 1907; at the time there were only three listings: The D.C. Beggs Co., The Home Store, and Columbus Dry Goods Co. In 1910, there were only four, as most general retail operations were still listed under “Dry Goods.” “Clothing-Retail” was another listing, one that had been around since 1886. Early on it referred to men’s clothing only, but with the advent of women’s ready-made garments, it could have included shops selling women’s clothing as well. By 1910 there were 66 retail clothing shops listed in the city directory. When ready-made clothing began to replace custom-made garments at the end of the 19th century, a retail revolution was starting to take place. 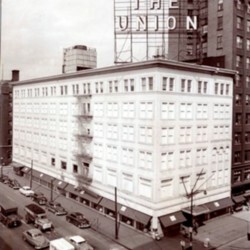 Wholesalers, such as Marshall Field’s in Chicago hired Harry Gordon Selfridge to expand its retail operation. Dry goods merchant R.H. Macy in New York, and men’s clothier John Wanamaker in Philadelphia began to create vast retail stores in their respective cities. 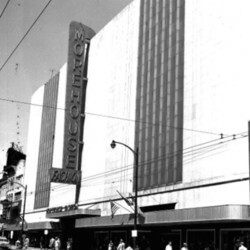 This was the beginning of the golden age of the department store. Columbus too would have its own large retail emporium in the guise of the F. & R. Lazarus & Co., or, simply, Lazarus.